Nancy Pelosi, Minority Leader of the U.S. House, is pictured with Local 98 attorney Jack O'Neill (left), Local 98 political director Marita Crawford (second from left) and consultant Billy Miller (right). Bipartisanship feels like an ancient relic in 2018. So it warmed Clout's heart this week when Democrats gave their friends across the aisle a gift. In the middle of one of the most contentious midterm election campaigns in decades, U.S. House Minority Leader Nancy Pelosi got her picture taken with Billy Miller at an event in Philadelphia. Miller, a local political consultant, pleaded guilty to evading taxes on nearly $400,000 in income in April. The photo was snapped Tuesday at a fundraiser for the Democratic Congressional Campaign Committee at SOUTH Restaurant & Jazz Parlor on North Broad Street and posted on Facebook. It also showed Pelosi alongside Jack O'Neill, in-house legal counsel for the city's politically powerful Electricians union, and Marita Crawford, the union's political director. Electricians Local 98 is under investigation by the feds, and Crawford's phone was tapped by the FBI from 2015 to 2016. (The union has denied any wrongdoing.) Miller has done consulting work for Local 98. It's a negative ad-in-the-making for the Republican Party. All that's missing is a bow. 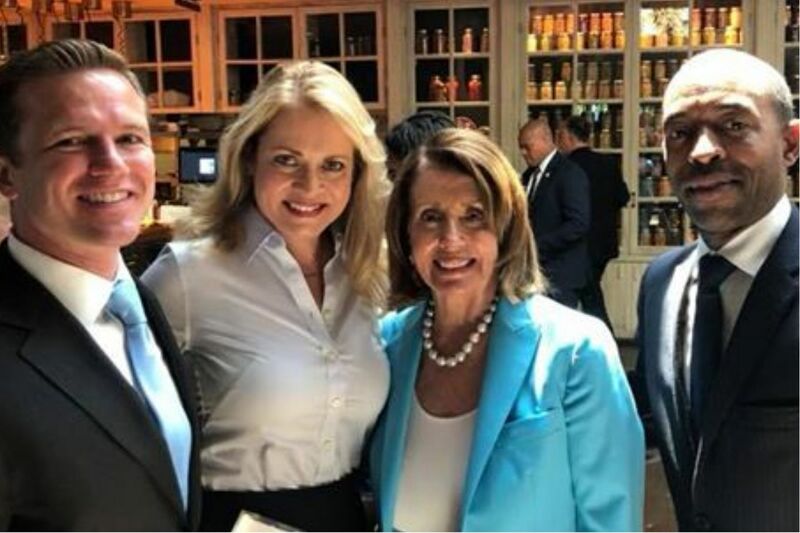 Jorge Aguilar, a spokesman for Pelosi, said after this story was published that she "attends hundreds of fundraisers across the country, taking pictures with many individuals." Miller didn't respond to a request for comment. A spokesman for Local 98 didn't comment, either. Pelosi has been a tad tone-deaf in the past. When Congressman Bob Brady announced this year he wasn't running for reelection after being investigated by the FBI for much of 2017, she released a statement calling him "our beloved 'Mayor of Capitol Hill.'" The statute of limitations expired earlier this year on almost all the charges that Brady might have faced. He was at Tuesday's fundraiser, too. It sure is a mystery why voters think politicians are out of touch. When did a church-linked gun warehouse become a must-go campaign stop for GOP pols? Usually, we here at Clout World Headquarters try to decipher politics for you. But we can't wrap our heads around a recent development in Pennsylvania campaigns. How exactly did a gun manufacturer in Pike County linked to an alleged cult become a required stop for Republican candidates? Scott Wagner, the GOP nominee for governor, attended a meet-and-greet at the Kahr Arms-owned Tommy Gun Warehouse Sunday. He was hosted by the owner, Justin Moon, and the Pike County Republican Party. Moon's brother, Pastor Hyung Jin "Sean" Moon of the World Peace and Unification Church, gave the invocation. His church in neighboring Wayne County made news this year for hosting a blessing of married couples who were urged to bring along their AR-15 rifles. The guns, conveniently, are sold at the Tommy Gun Warehouse. This has a whiff of the controversy Republican Paul Mango had to deal with this year. In January, the then-candidate for governor nodded along during a video chat as Pastor Moon claimed public school students are "indoctrinated into the homosexual agenda." The Democratic Party pounced on Wagner's claim that he was just visiting a business and had nothing to do with the long-controversial church. Wagner turned testy when asked about the event during a town hall meeting Wednesday in Westmoreland County, accusing the questioner of trying to embarrass him. Pike County Republican Chairman Christopher Decker told the Pittsburgh Post-Gazette that the Wagner campaign was "clearly caught off guard by it and panicked." Not a good look. Seriously, why are politicians doing this? Steven Burlein, chairman of the Wayne County Republican Party, said he likes that Kahr Arms opened a business in the next county over. But he's not so impressed with Moon's church in his county. "I don't mean to sound ignorant about it, but I've written them off as crazy," Burlein said. GOP leaders in the state House renewed their call this week for the Democratic Party to tell State Rep. Vanessa Lowery Brown to withdraw from the Nov. 6 general election, since she is still awaiting trial on criminal charges. That struck us as funny. After all, the West Philly Democrat is the only candidate on the ballot. The Republican Party didn't bother to field a candidate to challenge her this year — or in 2016, even though Brown has faced charges since late 2014. Perhaps Republican leaders have written off the 190th District as hopeless, since 87 percent of the voters there are Democrats, just 4 percent are Republicans, and 9 percent are independents or members of smaller political parties. Or maybe the Philly GOP needs a shot in the arm. Brown is accused of taking $4,000 in bribes from a lobbyist acting as an undercover operative for law enforcement. Her trial has been delayed by an appellate issue. Street said his fellow Republicans calling for Brown to get off the ballot are being ridiculous. Street also said he expects Brown will be acquitted when her trial is finally held. "The rule of law and our system of government, the presumption of innocence prevails until you've been found guilty," said Street, who knows a thing or two about having his day in court.